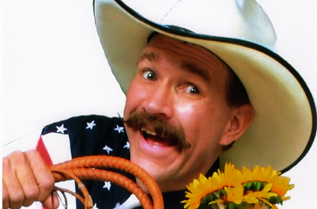 Terry blends cowboy skills like rope spinning and whip cracking with lots of audience participation to perform a comedy western show that is guaranteed to please everyone! A winner of the National Wild Western Arts Comedy Award, Terry’s show offers down-home comedy that would make Will Rogers proud. The T. Texas Terry show continues to be a popular show year after year at State Fairs, Company Events such as Holiday Parties or Sales Meetings, After-Grad Events and School Programs with Terry seamlessly blending your message with his cowboy hijinks! People Per Hour:	As many as you can handle!